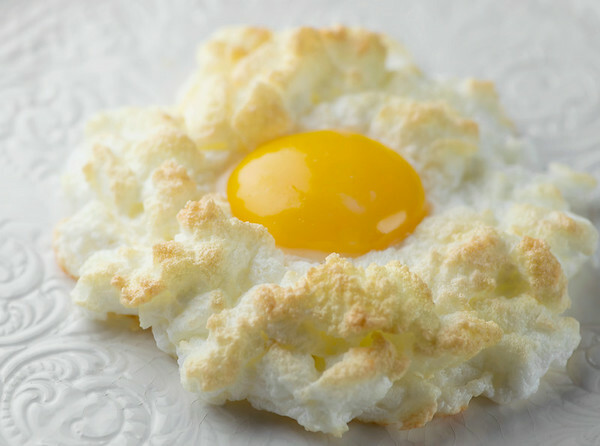 Make a simple egg a heavenly creature with this easy and dramatic recipe for eggs in clouds! It is like breakfast magic on a plate. Right after I made this super, super, super simple recipe I posted that picture up there on Instagram and Facebook, and got a whole bunch of “how did you DO that? ?” comments, which made me both ridiculously happy and slightly embarrassed to admit how easy it is to create Egg Drama. So I just said “egg magic” and left it at that. And it IS kind of magical that you can take an egg and a little shredded cheese and 15 minutes later have this. But it’s not a fantasy, it’s real…and here’s how. 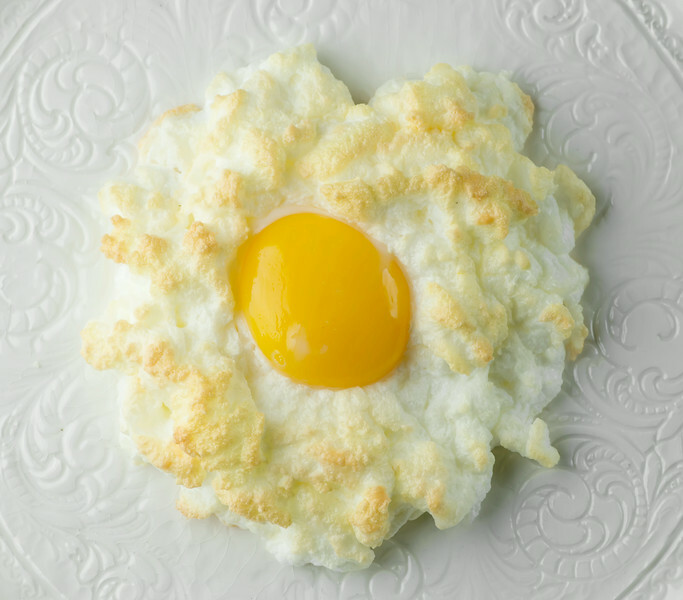 You need: a mixer, a cookie sheet lined with parchment or a silicone baking sheet, a little shredded Parmesan cheese, and as many eggs as you want to make egg clouds of of. One egg per egg cloud. Now separate the eggs, putting all the whites into a mixing bowl together, and each yolk into a separate little cup. Here’s my chance to tell you if you invest in a set of little Pyrex prep bowls (Click here for my favorites) you will use them SO MANY TIMES that you will wonder how you ever lived without little Pyrex prep bowls. Whip the egg whites until they form nice sturdy peaks – just like you are making meringue. This will take a good 2-3 minutes in the mixer. When they are whipped, gently fold in the grated parmesan. Now divide the the whipped egg white into little round clouds on your baking sheet. If you whipped four egg whites, you should make four clouds. Make a little dent in the center and pop them in a hot oven for 3 minutes. After 3 minutes, slide the baking sheet out of the oven and carefully slide the egg yolk into each little dent in the center. Back into the oven for another 3 minutes. Really. No kidding. That’s it. Eggs in clouds. Because we all need a little magic in our breakfast now and then! Preheat oven to 450 and line a sturdy cookie sheet with parchment paper or a silicone baking mat. Separate eggs, putting the whites in a large mixing bowl and the yolks in separate little cups. Whip the whites at high speed until stiff peaks form, about 2-3 minutes. Gently stir in the cheese, then divide the whites into 4 “cloud” shapes on the baking sheet. Make a little well in the center of each cloud. Bake for 3 minutes, then slide the cookie sheet out and gently slip a yolk into each well. Cook for another 3 minutes. Gently remove with a spatula and serve! Love this! If I prefer a firmer yolk, can I out the yolk on the nest right at the beginning? Thanks! You can absolutely add them at the beginning! I tried them today. I checked them at six minutes (but only had the oven at 350, since I was doing biscuits at the same time) and they were not done, so I left them in. 15 minutes (along with the biscuits) at 350 was perfect! this is a very nice and yummy idea, thank you ! My pleasure – hope you love it as much as we do! Hi Kate – the recipe says 450 but your comment here says 425. Which is the temp you use? This recipe and savory surprise made my 10 and 1/2-year-old VERY happy — we served on hot buttered toast – perfect for a lazy dog day of summer morn. Hot buttered toast (a thing of beauty in itself) would be PERFECTION with these. I’m going to try that next! Wow! I had never hear of these. Totally makes sense and I cannot wait to try them out. So very cute. Thanks Kate. We can’t do dairy. Could I eliminate the cheese or would I need to substitute something in its place? Thanks! This recipe looks delish. Hi Becca! I think if you added a little seasoning to the whites – just salt and pepper to give them a little zing – they would be fine. The major flavor comes from the lovely yolk! I would sprinkle some nutritional yeast to replace the parmesan. Should punch up the taste without adding dairy. I am a disaster in the kitchen – But saw this and thought, why not! Made it for my two daughters aged 4 and 3, whipped up the egg whites, forgot to add the parmesan so sprinkled it on the top before I put the ‘clouds’ in the oven and served on brown buttered toast – They loved it!! Every morsel consumed with passion! No more tinned beans on toast for my two!! Well, you are no longer the world’s worst cook then! I’m so glad they (and you) liked it! Such a neat idea and simple. Can’t wait to try them in the morning! I’m so amazed! How did you ever think of these?! I had a vague memory of these from my childhood (can’t remember if it was at home or at a restaurant), and so did a friend of mine who reminded me of them recently…so I decided to recreate them. Just as good as I remembered! We have been eating these for many years, but we fix them a little different. We put a slice of bread down, then a slice of cheddar cheese, then the whipped egg whites, then the yoke, then sprinkle the parmesan cheese on top and cook in oven till done. OMG they are so yummy! These are brilliant! I’m in the breakfast making doldrums, so this will be a fun new twist in the morning. Thanks! He is going to LOVE these eggs. Hurray! Gotta get those kids to eat their eggs! Nice job. Have you consider frying them? How about adding sautéed sliced mushroom, or chopped pepper and onions, Lots of possibilities. I like it very much. I don’t think the clouds would fry well – I think it needs the circulating heat of the oven. But definitely try the mix-ins! I have been making baked eggs for years. I use dry toast then put the whites on leaving a hole in the middle for the yolk. Not impressed at all. I followed this recipe and the egg whites collapsed as soon as I folded the cheese in. If I was to truly describe how I’m feeling after making this I would say that I’m frustrated and pissed off. ???????????????????????????????????????? Hey Matt! I don’t blame you for feeling frustrated – that’s exactly how I feel when recipes don’t come out right. I’m thinking that if you try it again (and I hope you do – these eggs are so good, I promise) you could try beating the egg whites a little more so that they are a little firmer, and then make sure the cheese is really grated finely. I like to use a microplane grater for my cheese so that it comes out super light and fluffy. One way or the other, I appreciate your feedback – truly! Hi Matt. Try adding the tiniest bit of cream of tartar to your egg whites as you beat them. 1/8th of a teaspoon for every egg white. Beat your eggs to stiff white peaks before you incorporate the mix ins. Cream of tartar is an absolute must for most recipes that call for stiff beaten egg whites ( like angel food cakes or meringues) but surprisingly few recipes seem to list it in their ingredients. Thanks Tess – great suggestion! Is there risk of Salmonella from the raw-ish yolk? Used to love Sunny Side Up, but then got scared at age 11, since I found out about Salmonella… I loved dipping toast in it or just making a sandwich out of it! Now I only scramble since I don’t like well done solid yolks, and I cook them BROWN lol Luckily my son loves them that way, but back to my point, sorry… adhd… Does the 6 min for whites and 3 min for yolk eliminate the risk? Beautiful piece of artwork btw! Kudos! just wanted to share a old technique for frying eggs that you may like to pass on to others. Use about a half to a whole teaspoon of Hot or Mild Giardiniera oil to an equal amount of butter and fry 2 to 3 eggs to your liking. Talk about hot and Zesty! you won’t need any salt or pepper to say the least. I have to admit that I dive in dipping with fresh French bread. I was excited when I saw this recipe on TODAY Show’s website. I bought parm so I can make them. Thanks for a gorgeous recipe. Thanks Martha! It’s so much fun!